TT Patton’s Tips on Keeping Your Fountain Pen in Tip Top Shape – Write with us! Storing our Cross Townsend nib up ensures that when we’re ready to write, our pen will be too. ALWAYS store your fountain pen horizontally or nib up. Otherwise, the ink flows from the barrel to the nib, and can clog your pen, especially if it dries inside. Every third time you refill your fountain pen’s ink, flush the pen out using cool water–simply let it run through the nib until it flows clear. Allow for your pen to dry overnight before replenishing its ink supply. Not yet an avid fountain pen user? The Pilot Metropolitan is the perfect place to start. 3. If you discover your ink has stopped flowing, and can’t get it going again even after flushing, try soaking the nib in a little water overnight, and if you still don’t see any progress, add a little squirt of Windex to the water, and soak once again. 4. If you bring your fountain pen with you on an airplane, make sure to unload your ink before flying, as the pressure can impact the way your ink flows. 5. And finally, keep your pen yours. Don’t lend it out. A fountain pen’s nib adjusts over time to the way you write with it–light-handed or heavy, lefty or righty, so it will flow better for you than for anyone else. 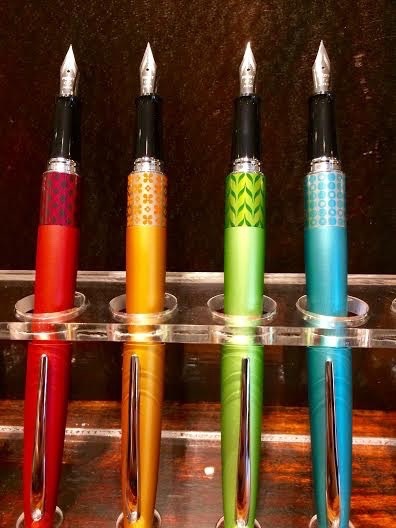 If your fountain pen problems are still troubling you, stop into TT Patton for some expert advice–and celebrate National Fountain Pen Month this August by bringing your pen in for a complimentary cleaning!